Searching for a locksmith in Greenwood? The team of experts at Pro-Lock and Safe is just down the road and we would be glad to handle any problems that you encounter. Whether you locked your keys in the car and you’re looking for someone to let you in or it’s time to replace the locks on your doors and home and get everything up to date, we would be happy to help you out. We pride ourselves on providing our customers with a level of service that is simply unmatched by others in our industry and we’ll go above and beyond to make sure that you get the help you need–any time of the day or night. Whether it’s the middle of the night, first thing in the afternoon, or any time in between, you can count on the team at Pro-Lock and Safe to be there for you when you need help the most. When you call, we’ll answer. It’s as simple as that. Regardless of the issue you’re facing, you can rest assured that we’ll make it a priority to get to you quickly so you can get back to your day. With over three decades of experience in our industry, we can handle anything that comes our way. No matter what situation you find yourself in, we can help. When you call, we’ll give you an estimated time of arrival along with a free quote for the work you need done so you know exactly what to expect. 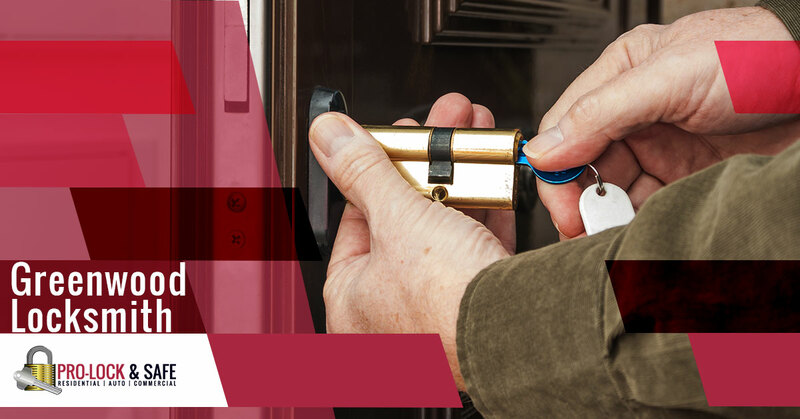 No job is too big or too small for us to handle, so if you’re need need of a local locksmith in Greenwood, you can turn to our team to get the help you’re looking for. Give us a call today!